The ISO system is used to determine the Fire Suppression Rating Schedule of your Fire Department it is based on a scale of 1 to 10, with 1 being the best score. This ISO rating schedule examines many factors relating to your local fire department, focusing on training, equipment and locations of stations in the community. This ISO rating is used by your insurance company to determine premiums for homeowner policies. 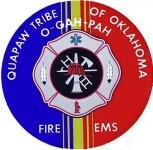 The Quapaw Tribe/EMS currently operates three (3) stations within Ottawa County. The main station, Station1, is located on Hwy 69a East of Commerce Oklahoma. Station 2, is located at Downstream Casino and Resort located at Mile Marker 1 just off Interstate 44 at the Oklahoma/Missouri State line. Both of these stations operate 24 hours a day 365 days a year, there is a four person staff at each station with two EMT-Basics and two Paramedics on duty at all times. Two ALS ambulances, a 1500gpm pumper and water support trucks are housed at both Stations. The third station, Station 3 is located in Wyandotte, OK. This station houses one ALS ambulance staffed 24 hours a day 365 days a year. The Downstream Station not only covers the casino but also has an automatic aid agreement in place with the Town of Commerce, the Town of Quapaw, the Town of Peoria and the Town of Wyandotte. This is in place to protect the residents of the rural areas of the Northeastern Ottawa County. The new ISO rating of Class 2 for the district will be effective August 1, 2015, and residents affected by the change are encouraged to check with their insurer to take advantage of any possible lower rates.